1. Get on hands & knees facing the couch. 2. Grab the couch & pull into kneeling position. 3. Keeping feet in the same place, straighten legs completely. 4. Shuffle feet forward so that body is not at a 45-degree angle to the floor. At step three, he kind of looks like he's doing push ups. Eventually, after standing there for a few minutes, he'll get tired & start fussing because he can't figure out how to get down. The same applies if he manages to pull himself up when in his crib. Though if he's reluctant to sleep, he mostly just crawls around, with intermittent flops onto his belly. Last night he fell asleep across the crib, head against one side, legs frogged up & feet against the other. Not sure when it happened, but he's started sleeping on his belly every night. Also on the mobility front, Sprout has figured out how to get up two stairs or clamber over large obstacles like a big bag or Papa lying on the floor. He really delights in crawling around on our bed in the mornings, threatening to jump off the sides. Tooth #7 finally broke through after a couple of months teething hiatus. I imagine he'll get the other side's lower incisor soon, as it's a bit swollen as well. These two seem to be bothering him more than the other bottom teeth did & he's been chomping on everything, including my collarbone when I'm holding him. 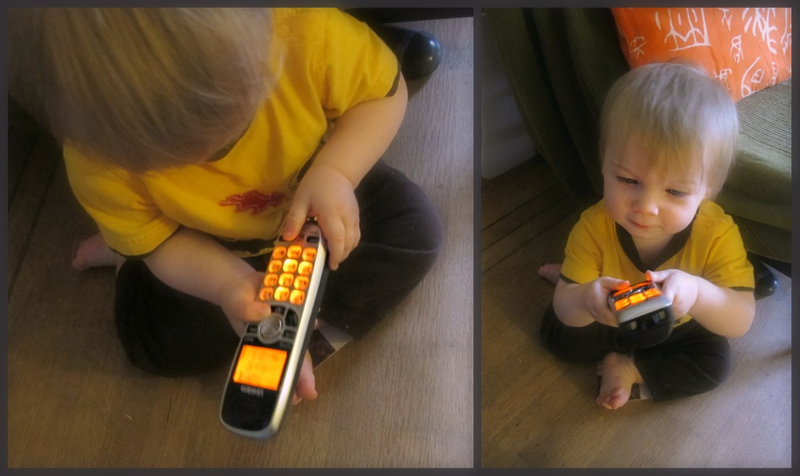 This week's favourite toy is a three-way tie between the TV remote, the DVD remote & the phone. He's currently trying to make some calls right now. A few minutes ago he dialled '8888' & it started ringing before Papa disconnected him. Things with lights & buttons & beeping noises really attract him. I have to admit, though the phone isn't an ideal toy for him, the sounds it makes are a lot less annoying than most children's toys. my nephew had the same strange phone obsession. eventually they got him one that wasn't 'live' so that he could play with it without accidentally calling the cops. and then we all learned to keep our phones on higher shelves.